SITUATED to the western side of the town and within level walking distance to the Royal Military Canal. Hythe town centre offers a range of shopping facilities and amenities together with doctors' surgeries, dentists and library. Primary schooling is located in both Palmarsh and Hythe with secondary schooling being available in nearby Saltwood. Boys' and girls' grammar schools are both located in Folkestone. Sandling mainline railway station, the M20 Motorway, Channel Tunnel Terminal and Port of Dover are also easily accessed by car. High speed rail services are available from Folkestone West approximately 15 minutes by car giving fast access to London St Pancras in just over 50 minutes. A well-appointed four bedroom detached family home with gated driveway, attached garage and rear garden. The property enjoys a modern fitted kitchen/breakfast room, a spacious living/dining room and a conservatory to the ground floor, while upstairs are four bedrooms and a study, a fitted bathroom and separate toilet. With pleasant views of the 'Roughs' to the rear, double glazing to all windows and external doors (with the exception of the garage) and gas-fired central heating, an early viewing of this versatile family home comes highly recommended. The property enjoys a paved pattern impressed concrete front driveway with a five bar gate, providing off street parking for two/three cars and accessing the attached garage and covered porch. There is also a side gate adjacent to the garage providing access to the rear garden (currently closed off). The rear garden has a decked area with balustrade by the conservatory, a personal door to the garage, and a step down to the rear garden which has been laid to artificial grass. There is also a timber summerhouse, and a selection of mature trees and shrubs. 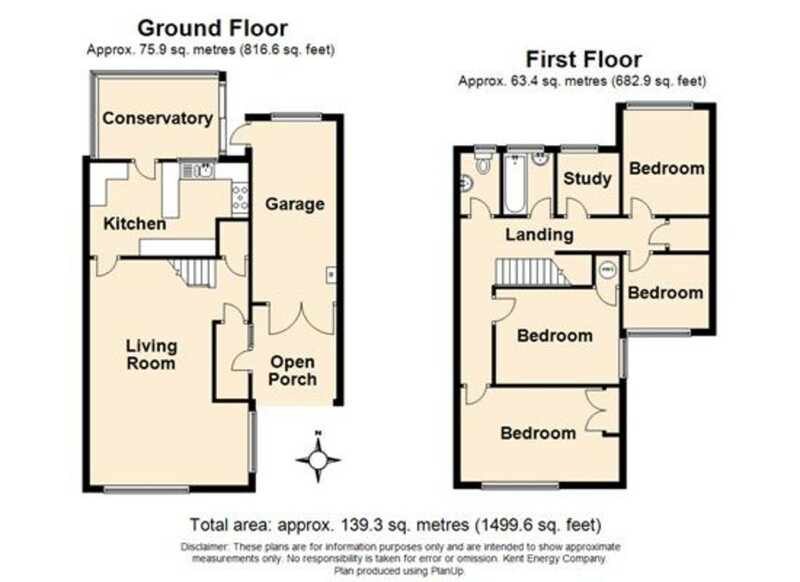 GARAGE 17'8 x 8'3 with wooden double doors, power and light, wall mounted Potterton gas-fired boiler, electric and gas meters, consumer unit, two water taps, a rear window, personal door to the rear garden.